Cherif, M., Zarrad, R., Gharbi, H., Missaoui, H. & Jarboui, O. Length-weight relationships for 11 fish species from the Gulf of Tunis (SW Mediterranean Sea, Tunisia). Pan-American Journal of Aquatic Sciences, 3(1): 1-5. Download PDF file (152 Kb). Stefanoni, M. F. & Abessa, D. M. S. Lysossomal Membrane Stability of the brown mussel Perna perna (Linnaeus) (Mollusca, Bivalvia) exposed to the anionic surfactant Linear Alkylbenzene Sulphonate (LAS). Pan-American Journal of Aquatic Sciences, 3(1): 6-9. Download PDF file (63 Kb). Bornatowski, H., Robert, M. C. & Costa, L. Dados sobre a alimenta��o de jovens de tubar�o-tigre, Galeocerdo cuvier (P�ron & Lesueur) (Elasmobranchii, Carcharhinidae), do sul do Brasil. Pan-American Journal of Aquatic Sciences, 3(1): 10-13. Download PDF file (39 Kb). Martorelli, S. R., Marcotegui, P. S. & Suriano, D. M. Squalonchocotyle squali MacCallum (Monogenoidea, Hexabothriidae) on Squalus acanthias Linneaus (Elasmobranchii, Squalidae) from the Atlantic coast of Argentina. Pan-American Journal of Aquatic Sciences, 3(1): 14-17. Download PDF file (156 Kb). Castello, L. Re-pensando o estudo e o manejo da pesca no Brasil. Pan-American Journal of Aquatic Sciences, 3(1): 18-22. Download PDF file (64 Kb). Corr�a, M. de O. D. A. & Uieda, V. S. Composition of the aquatic invertebrate fauna associated to the mangrove vegetation of a coastal river, analyzed through a manipulative experiment. Pan-American Journal of Aquatic Sciences, 3(1): 23-31. Download PDF file (339 Kb). Horta, S. & Carranza, A. Observations on the ecology of the hermit crabs Propagurus gaudichaudii Milne-Edwards (Decapoda: Paguridae) and Dardanus insignis Saussure (Decapoda: Diogenidae) in the outer uruguayan shelf. Pan-American Journal of Aquatic Sciences, 3(1): 32-35. Download PDF file (87 Kb). Selmi, S. & Sadok, S. The effect of natural antioxidant (Thymus vulgaris Linnaeus) on flesh quality of tuna (Thunnus thynnus (Linnaeus)) during chilled storage. Pan-American Journal of Aquatic Sciences, 3(1): 36-45. Download PDF file (146 Kb). Vaske Jr, R., Lima, K. L., Ribeiro, A. C. B. & Lessa, R. P. Record of the St. Helena deepwater scorpionfish, Pontinus nigropunctatus (G�nther) (Scorpaeniformes: Scorpaenidae), in the Saint Peter and Saint Paul Archipelago, Brazil. Pan-American Journal of Aquatic Sciences, 3(1): 46-48. Download PDF file (90 Kb). Arias-Schreiber, M., Wolff, M., Cano, M., Mart�nez-Daranas, B., Marcos, Z., Hidalgo, G., Castellanos, S., Valle, R., Abreu, M., Mart�nez, J. C., Diaz, J. & Areces, A. Changes in benthic assemblages of the Gulf of Bataban� (Cuba) - results from cruises undertaken during 1981-85 and 2003-04. Pan-American Journal of Aquatic Sciences, 3(1): 49-60. Download PDF file (580 Kb). Quaggio, A. L. C., Kotas, J. E. & Hostim, M. As capturas do tubar�o-azul, Prionace glauca Linnaeus (Elasmobranchii, Carcharhinidae), na pescaria de espinhel-de-superf�cie (monofilamento), sediada em Itaja� (SC), Brasil. Pan-American Journal of Aquatic Sciences, 3(1): 61-74. Download PDF file (808 Kb). Please, check the erratum of this article. ERRATUM. Filla, G. de F., Atem, A. C. G., Bisi, T. L., Oliveira, L. V., Domit, C., Gon�alves, M., Havukainen, L., Oliveira, F., Rodrigues, R. G., Rosas, F. C. W., Santos-Lopes, A. R. & Monteiro-Filho, E. L. de A. Proposal for creation of a �zoning with regulation of use in the Canan�ia estuarine-lagoon complex� aiming the conservation of the estuarine dolphin, Sotalia guianensis (van B�n�den) (Cetacea, Delphinidae). Pan-American Journal of Aquatic Sciences, 3(1): 75-83. Download PDF file (140 Kb). K�nig, R., Suzin, C. R. H., Restello, R. M. & Hepp, L. U. Qualidade das �guas de riachos da regi�o norte do Rio Grande do Sul (Brasil) atrav�s de vari�veis f�sicas, qu�micas e biol�gicas. Pan-American Journal of Aquatic Sciences, 3(1): 84-93. Download PDF file (291 Kb). Dias, T. Original scientific photographs. 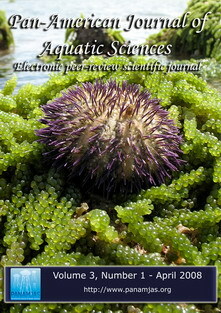 Pan-American Journal of Aquatic Sciences, 3(1): I. Download PDF file (120 Kb). Bertoncini, A. A. & Lewis, D. dos S. Original scientific photographs. Pan-American Journal of Aquatic Sciences, 3(1): II. Download PDF file (70 Kb).